Portrait of happy Caucasian woman with a camera. 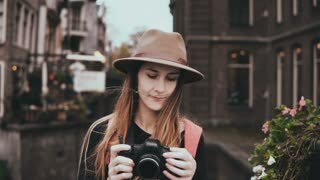 Attractive cheerful lady in stylish hat taking a picture 4K front view. Portrait of young ethnic brunette holding hands on face while posing and looking sensually at camera smiling slightly under palm trees.